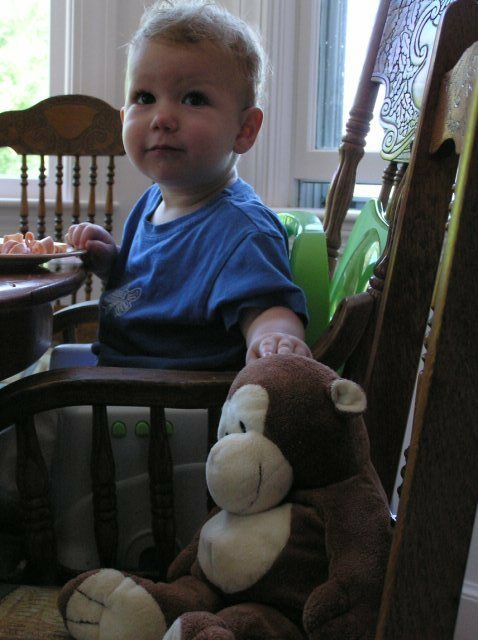 When Weston was a little older than a year, Monkey arrived. It was love at first sight, really. Maybe more for me than Wes at first, but the second I saw that little monkey-shaped bundle of love staring at me from the basket in the toy store I knew we needed to bring him home. Weston and Monkey soon became inseparable, and I started to get concerned about what would happen if Monkey got lost (crazy first-time mother stuff, clearly). So one monkey soon grew to be a family of monkeys (two full-size replacements and two little ones for travel — I told you, crazy), complete with Daddy Monkey, Mommy Monkey, Teacher/Babysitter Monkey and the babies. Nearly six years later, The Monkeys still hang out with us, lined up and tucked in at the foot of Weston’s bed. But Daddy Monkey, Weston’s favorite, is starting to look like the babies have kept him up at night and his job is stressing him out. I know the day will come when we pack up The Monkeys and send them to the attic, but it sure would be cool to memorialize them while they’re still in decent shape. A super-cool company that memorializes your kiddo’s lovey (or any loved object, really) in a totally modern way, Hippopota owner Christian Jaillite photographs the subject, capturing the essence of it and nothing else. Just contact him to make arrangements, send him your object (to be returned, of course), and in 2-3 weeks you can have a masterpiece of your child’s favorite pal that’s hip enough to hang in your dining room. Okay, first…the pic of Wes and his soft friend. Priceless. The PHOTO…OMG!!!! YOU KNOW this was meant for me. I am doing this straight away. I have ideas… I have ideas! THANK YOU for this uber cool post. This is unique.